Love! Just a word for all, but means the world to some. Meet Aakash Iyer, an IIT aspirant, embracing a career in marine engineering, by an utter fluke. Amidst his exploits at the hostel, where life transforms the introvert Aakash into an exuberant, he gets introduced to love through the eyes of a sweet and reserve natured girl, Anika, outside the hostel. Everything is going just fine, till Aakash meets Pallavi. Pallavi, known for her predictions, presents Aakash with the three Connectors to connect his love life. 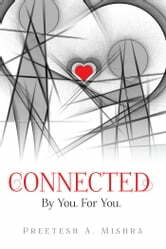 Determined to succeed and win Anika forever, he sets his way to get head on with the Connectors, till he finds out something really ugly. CONNECTED. By You. For You. is the story of Aakash, striving for a "happily ever after" tag along his and Anika's name. Do the Connectors have some hidden secrets within them? Will Aakash overcome the challenge of connecting the three Connectors? Or will the Connectors screw his life forever? Join Aakash in his journey, as he dreams to usher Anika into his heart.